Helmet, knee pads, shin guards and…mouthguard! If your child participates in sports then you may want to consider including a mouthguard in their list of protective equipment. According to the American Academy of Pediatric Dentistry, up to 39% of all injuries to the mouth, face and teeth are sports-related. Protecting your smile and mouth with a comfortable, custom-molded mouthguard will dramatically reduce the risk of sports-related oral injury. What is a Mouthguard? A mouthguard is a comfortable piece of athletic gear that fits over your child's teeth and provides protection for his/her smile, teeth, lips, tongue, face and jaw. The latest literature demonstrates that mouthguards dramatically reduce the severity and incidence of many injuries including tooth fractures, tooth displacement, concussions and jaw-joint injuries. Who should where a mouthguard? 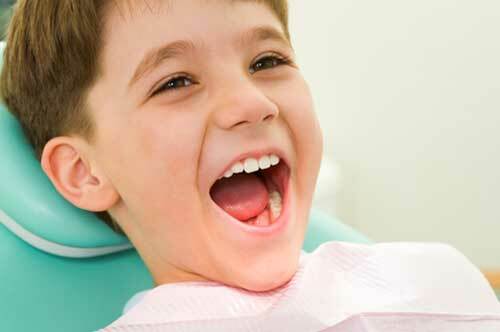 Because the face is an important part of your child’s self-confidence, it's better to be safe than…toothless! Stock Mouthguards: Stock mouthguards are often available at drug stores and sporting goods stores. These are the most inexpensive option but may feel bulky and uncomfortable to your child because they are not custom-fit. Because they are not custom-fit to your child’s teeth, the only way to keep the mouthguard in his or her mouth is to bite on it. Maintaining a closed bite for the entirety of an athletic event makes speaking and breathing difficult. Therefore, your child may choose not to wear it. Mouth-formed Mouthguards: Mouth-formed mouthguards are more custom fit than the ready-made variety but less so than a custom-made variety. These are made of a thermoplastic material and are customized by heating it in water, then biting it. This type varies greatly in protection, retention, comfort and cost. Custom-Made Mouthguards: Custom-made mouthguards are the superior type with regard to retention, protection and comfort. At Lone Tree Pediatric Dentistry, we will take an impression of your child’s teeth and you will return a few weeks later for your child’s newest and best piece of protective equipment! In determining the type to select for your child, remember that the best mouthguard is one that will be worn. Dr. Nick recommends the custom-made variety because they are the most comfortable, will be worn the most and will provide the best protection. Mouthguards should be worn during both practice and games. Limit chewing on the mouthguard as much as possible as this may weaken the material. Any defects such as holes, tears, and damage to the mouthguard may irritate your child’s gums or soft tissue. After wearing it, your child should rinse the mouthguard with cold water or mouthwash. Additionally, it should be cleaned regularly with a toothbrush and toothpaste. The mouthguard should be stored in a firm, perforated container. Placing it in direct sunlight or storing it in high temperatures should be avoided as this may deform the mouthguard.